Some people don't celebrate Christmas. Then there are people who would, but they are alone in the area without family. Even if Santa did come to your house, what happens after you've already eaten the candy cane pancakes and opened the gifts? Is there anything to do in Phoenix on Christmas Day? There are plenty of places to go out to eat, but that doesn't necessarily take all day. This might be the year that you decide to volunteer to help out those in need. For other activity ideas, read on. If Santa is bringing you ice skates this year, CitySkate in Downtown Phoenix is open on Christmas Day. It's an outdoor skating rink on real ice, rare in the middle of the desert. There are also several synthetic ice skating rinks set up just for the holidays. Check the holiday events schedule to find these rinks, typically at shopping malls or local resorts. To skate indoors on Christmas Day, visit AZ Ice. If you're into inline skating instead, there are plenty of public skate places where you can feel the wind on your face. See the beautiful fish, sharks, and more at the newest aquarium in the Valley of the Sun. It's located in Scottsdale, right off the Loop 101. This is also a great family-friendly activity if the kids get bored after opening presents on Christmas morning. In Scottsdale, both Butterfly Wonderland (people of all ages) and the adjoining OdySea Mirror Maze (best for adults and kids seven years old and up) are open 365 days per year. From 5:30 p.m. to 10:30 p.m., the Phoenix Zoo is open for ZooLights, with about 3.8 million lights in about 700 arrangements, many which are designs of animals that you might see at the zoo during the daytime hours. It's all about the lights during this event, as animal viewing is limited. Considering Phoenix doesn't get snow, and is usually sunny on Christmas, sometimes the best activities are al fresco. The Fountain is always open, so enjoy a nice, peaceful day at the large park in Fountain Hills. From penny slots to the poker room, if you are old enough to gamble legally and have the cash to spare, the surrounding casinos will be open (and so will their restaurants). Hundreds of thousands of lights are displayed in a show entitled Celebrate the Birth of Christ Light and Music Christmas Celebration. All faiths are welcome. The Mesa Arizona Missionary Choir will perform. Free, 5 p.m. to 10 p.m. The Musical Instrument Museum (MIM) in north Phoenix is open on Christmas Day from 10 a.m. to 5 p.m. It's a stunning museum, suitable for all ages and musical tastes. Everyone, from kazoo players to professional musicians, will enjoy their time spent here. Read more about visiting MIM. The Westin Kierland Resort & Spa in Scottsdale shares a unique holiday experience as it projects an animated 3-D show on the resort's main building. It's outdoors and free to watch. Play with the dolphins, hug a dolphin, and even get a Christmas kiss (no mistletoe required). The water is warm and wet suits are available, but if you prefer to stay dry, there is Dolphin Land Experience. Reserve your time online or by calling 480-407-5154. You'll find a variety of hiking trails, nature trails, and picnic facilities all over the central Arizona area, many of which are open on Christmas Day. Check online or call before you go. If you got new hiking boots, a GPS, or a camera this holiday season, these are great spots to test them out. 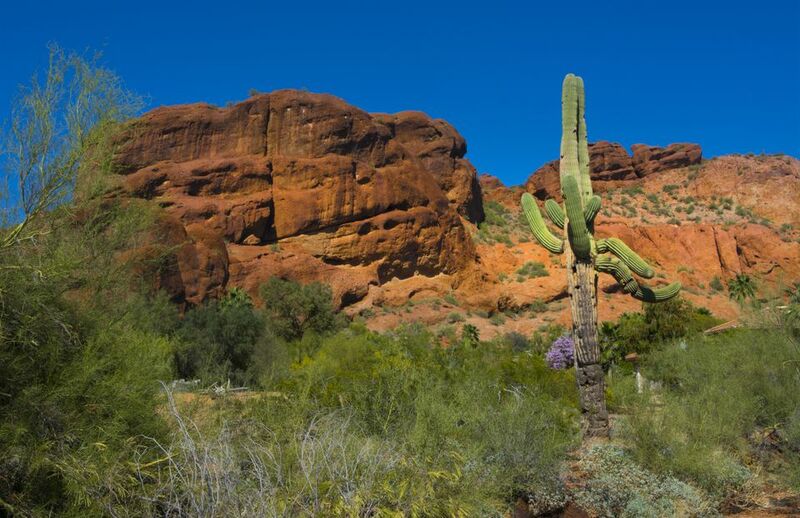 A few hiking trails that should be open are Camelback Mountain, Piestewa Peak, South Mountain, Cave Creek Regional Park, Spur Cross Ranch Conservation Area, and McDowell Mountain Regional Park. Thrill-seeking drivers can get a true taste of performance racing in state-of-the-art karts that reach speeds of up to 45 mph at Octane Raceway in Scottsdale. See what happens at Octane Raceway. If you are a golfer, there are actually a variety of courses around town that are open on Christmas Day. You'll probably have the best luck at resort courses. Here are some of our favorites. Sea Life Arizona will be open on Christmas Day from 11 a.m. to 4 p.m. with last admission at 3 p.m. Visit your favorite sea creatures in a festive, holiday setting. See a photo tour of Sea Life Arizona. This is a great time of year to visit animals, and Wildlife World Zoo & Aquarium on the west side of town is a local favorite spot. Feed a giraffe for us! This northwest Valley park is very scenic, and definitely an appropriate location for a picnic, a football toss, or a walk. There are lots of lakes in and around Phoenix just made for that new fishing pole. It isn't bass or salmon fishing, but it's still fun. Don't forget to catch and release. Golfland in Mesa has a video arcade, laser tag, and miniature golf. Those attractions are open on Christmas Day from 11 a.m. to 10 p.m. Starting at 3:30 p.m., use the Race Cars (until 9 p.m.) and the Bumper Cars (until 8:30 p.m.).